Thinking About a Water Garden? for an appointment or follow the instructions on the answering machine. Valley Water Gardens in Dayton, VA provides a complete line of water garden and pond supplies, plants, and fish to customers from Waynesboro, Staunton, and Harrisonburg to Front Royal, VA and in Rockingham, Augusta, Shenandoah, Page, Warren, Greene, Albemarle counties of Virginia plus Pendleton and Hardy counties in West Virginia. Valley Water Gardens sprang to life in 1995 to fulfill Charles Williams’ interest in water gardening. From the beginning, building a knowledgeable and workable relationship with each customer has been his goal. Customer satisfaction is a priority. 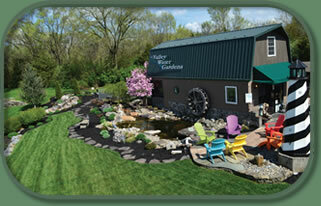 24 years of installation and servicing experience are the foundation of Valley Water Gardens. From the smallest pond with submersible pump/intake filter to the large pond with out-of-the-pond commercial pump/filtration package, Valley Water Gardens is a full service water garden center. We accept orders for a wide variety of outdoor, maintenance-free poly furniture, in a variety of colors. We receive shipments three times per year (spring, early summer, and late summer). Made in Lancaster County, PA, this applies to all selections of chairs, tables, swings, etc. Pick your choice of color combinations & order by phone or visit us. Copyright © 2002 - Valley Water Gardens LLC & Mountain View Product Marketing, Inc. All Rights Reserved.